Introducing the revolutionary VetGun, a fast and effective insecticide delivery system for controlling cattle parasites. The leading cause of economic loss in the cattle industry is parasites, particularly, horn flies. Horn flies interrupt cattle grazing and can cause blood loss of up to a pint per day, resulting in up to 30% less weight gain in just 80 days. 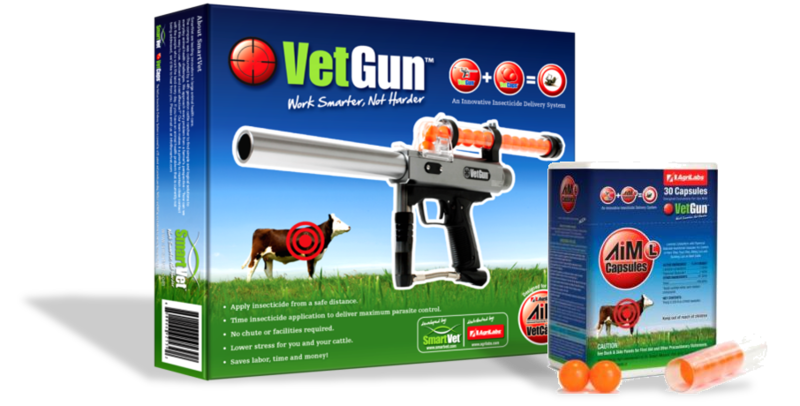 Protect your cattle from horn flies with the VetGun. Farmer’s Coop now carries the VetGun, an innovative delivery platform for effective fly control, when and where you need it! The VetGun™ is a fast and easy insecticide delivery system for controlling cattle parasites. The first-of-its-kind delivery system, provides a precise dosing with the pull of a trigger. The topical insecticide, AiM-L™, can be applied from as far away as 30 feet with no handling or stress for you or your cattle. You can give your cattle a break by eliminating the need to run cattle through a chute when treatment is needed, and it does not require additional labor or special handling facilities. It’s more efficient, plain and simple. 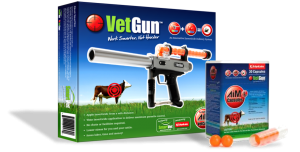 The Vet Gun is the only approved delivery system for the AiM-L™ VetCaps. It’s simple to operate, accurate and reliable. The VetGun is designed and manufactured with the highest standards and materials to consistently deliver each capsule to the target animal and is supported by an exceptional service guarantee. Pick you the VetGun at your local Farmer’s Coop. This entry was posted on Monday, July 18th, 2016 at 4:48 pm	and is filed under articles, Cattle, News & Updates. You can follow any responses to this entry through the RSS 2.0 feed. Both comments and pings are currently closed.